Welcome to another episode of WeritCast! So far, so good with keeping my new years resolution of putting out one video a week :) Today I am having a special two for the price of one deal! Yes, they are free to begin with but lets not get bogged down in the facts. In these videos, we take a look at Europa Universalis 3, with me playing Venice. You can find part 1 here. In this video Venice gets its first National Idea and we take a look around the map to see what is going on in the world. We also go to war with Algiers, which turns out not to be such a good idea. In episode 4, the war with Algiers winds down. Will I come out with anything? Watch and see :) The second war with Naples starts up, with a goal of making it my vassal. For the last few weeks, I have been trying out a new game: Illyriad. It's not something I'd normally play, but twitter folk were talking about it so I figured I'd five it a shot. It's a browser based game (HTML 5 I believe) where you build up a kingdom in an expansive persistent world. I'll cut straight to the point. So far, I have not had much fun in the game. Don't get me wrong, there are a lot of things to do, but as of yet none of them are very interesting. Actions such as improving a resource and researching new technologies take time (up to days) to complete. Since I have started playing, all I've been doing is logging in, improving resources and setting up research. This has gone on for weeks and I have yet to experience any other part of the game. There is a military and sovereignty system (expand to other parcels of land), but I need to have a larger population and meet other requirements in order to experience those. For example, my Storehouse needs to be upgraded 15 times before I can research Sovereignty. As I have dabbled in making web games, Illyriad has taught me an important lesson. I need to give the player interesting decisions to make as early in their experience as possible. Upgrading resources and building for several weeks has not been very interesting. There is a microtransaction system called Prestige. It lets you take some shortcuts, but nothing overpowering that i have seen so far. You can even get this currency free for logging in once a day. I have not used any of the prestige I started out with yet either. Illyriad may have a lot of depth once I get past the building up stage, but I'm not sure that i am going to make it that far. I would like to mention its very kind community though. They are quite helpful and tend to be very generous. I asked a question, got a good answer and someone sent me a bunch of resources. As you may know from reading this blog, I tend to dabble in datamining the games I play. Most recently, this has been for Star Wars: The Old Republic, it even spawned a column on the popular fansite: TORWars. I've recently found out how to extract item data from the game. So now I need to figure out what I want to do with that data. There are currently several item databases, so I don't think there is space in that arena for me. Well, maybe that isn't true. I don't think any of these were designed with mobile devices as the focus. So what do you think, would a mobile-focused SWTOR item database be a worthwhile project? Recently, Mykiel over at Stratics.com had a chance to interview the Colorado Speaker of the House, Mark Ferrandino, about video games. Some of the topics discussed are his history with video games, thoughts on regulations, and online bullying. Today we have a special edition of WeritCast, one without me talking! I've been wanting to use this song for a while now, and now I have good gameplay footage to go with it. The video is set to Over the Tops Winner Takes it All. Oh how I love 80's music! The fight takes place in Black Crag, we successfully defend the keep and get the Heroic Defender buff. Enjoy! In today's 1.6.3 patch, a bunch of new Cartel Market items were included. Most of which seem to be mounts and possibly a new Sand People's outfit. These seem like likely candidates for the Space Pirate Cartel Pack to me. Below is the raw data... enjoy! One of the tasks in Warhammer Online's latest Live Event is to collect clues. There is a quest to gather them: Stealing a Birthright for Destruction and Rediscovering the Past for Order. Each requires 10 clues and you must do it 10 times to complete the task. That's a lot of clues. Everytime you complete a quest, you'll also reveal a text entry in the Pieces of the Puzzle section of the task list. These provide cryptic information about the next stage of the event. There is nothing to act on, so don't fret too much about figuring out what it all means. So where do you find clues? The first means is by clickable objects called Ancient Dwarf Plaques. 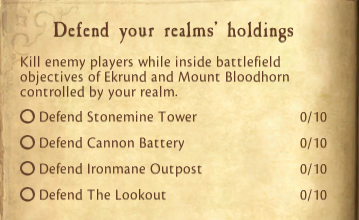 You'll find these in ruins in Ekrund and Mount Bloodhorn Battlefield Objectives. The best way to find them is look for a cluster of players camped at odd locations. You can also find them at the Kron Komar Gap Public Quest. The other way to obtain clues is off of the corpses of your fallen enmies. If they have the quest in progress, there is a chance that they will drop a clue as loot. This is rolled upon if you are in a group. 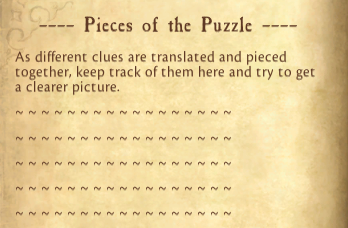 I've received most of my clues via this method so far. No way am I going to camp a spot instead of fighting. Finally, it should be noted that this live Event will be around for several weeks (I asked). So there is no need to rush when it comes to clues. I'm going to let the campers camp, then when they are done go pick them up if I have not earned enough from fighting. My 2nd Intel report for TORWars is now up! This time, the report contains information about upcoming Cartel Market items. This info is all datamined, so it could be incorrect, old, or slated for sometime in the distant future. Hope you enjoy it! 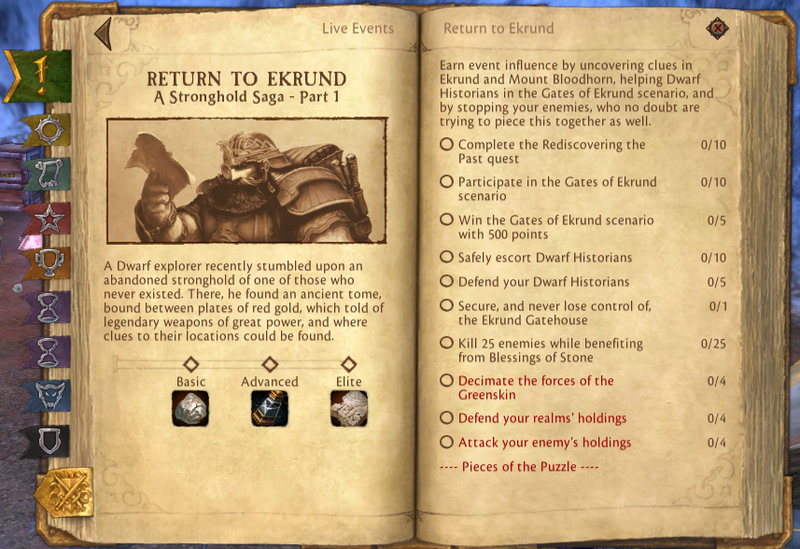 Yesterday, the Return to Ekrund Live Event started up in Warhammer Online. I spent several hours playing in Ekrund and had a pretty good time. I, of course, took some video of the action. It centers on some world RvR in Ekrund, while I talk about the overall event. So far, I've obtained the Basic Reward, which means there is still plenty left for me to do. Enjoy! 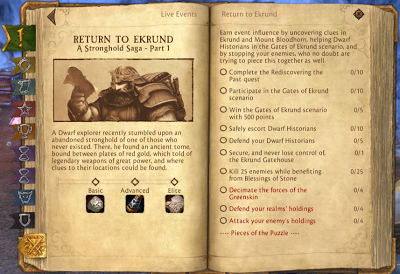 Warhammer Online's latest live event, Return to Ekrund is now live on the servers! I hopped on to take a look at the task list and the rewards, which are listed below. This all takes place in Tier 1, in or around Ekrund. If you are too high of a level, you will be reverse bolstered, so no need to worry about being chickened. Well, what do we have here? The Warhammer Online servers were brought down for a patch. 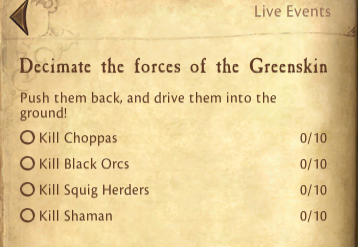 When they came up, there was a very interesting change to the Dwarfs vs Greenskins tier. All players, even 40's, can now go into the lakes and not be chickened! This most certainly has to do with the upcoming Live Event: Return to Ekrund. Players are, in fact, reverse bolstered based on their RR. In the image above, I am level 9. When I say level 9, I mean it. I only have access to abilities and tactics which I would have had at that level. My Mount? No go... it's like being back when the game launched. Except for gear, that still works as it did. Looking forward to when the live event starts! Yesterday, BioWare announced Game Update 1.7 to the masses. It is titled 'Return of the Gree' and contains two major features. The Gree are an ancient and enigmatic race who possess powerful technology. They are also known for their oddly talking droids. The two major features of this patch are Reputation and an Ilum revamp. Reputation. This is exactly what you think it is. More bars to fill, more rewards to acquire. The twist is that it is shared across your legacy, so you won't have to redo reputation gains with every character. That is a great improvement on the typical reputation system. World PvP. The former world PvP area. Ilum, will be seeing some major changes in 1.7. A renegade Gree vessel has landed on Ilum, and the Gree need your help in dealing with the situation. This is in a contested area, so Sith and Republic forces are bound to run into each other. The article is light on details, but it sounds like the Gree ship will have some PvE bosses in it, which both sides will compete over. It could be pretty simple, a ship open to both sides and the last side to hit the boss gets the loot. Or, they could be going for a Lake Wintergrasp where the winner of the event gets access to the ship. I'm pretty excited about this update, especially now that I have a 50 and can participate in the Gree event. I never experienced the old Ilum, so this will be my first taste of world pvp in SWTOR. As for the Reputation system, it all depends how grindy it is. I don't enjoy doing the same quests over and over, I'm looking at you Dailies, so this may not be something I get a whole lot of use out of. It's Friday! That means I am going to take the easy way out and post a video I found on youtube. This one is of a Wrath of Heroes match involving two teams of the CuLt group squaring off in the Pyramid of Settra. It has interesting music and has been sped up a bit. Until recently, WAR's scenario lineup was changed with each major patch version. That happened every few months, so the lineup ended up getting pretty stale. That is now no longer the case. Instead of changing with each patch, the lineup will change weekly, albeit slightly. All three scenario brackets will also now share the same set of four scenarios. It used to be that each bracket had its own set. To cut down on the amount of work needed to be done, it makes sense that they would all now have the same scenarios to choose from. The new system is: Once per week, the oldest scenario in the lineup will be removed, and a new one will be added. On the weekends, there will be an additional Weekend Warfront scenario added to the list for a total of 5 to choose from. I am pretty pleased with this direction. One of WAR's strengths is the amount and diversity of scenarios it has to offer. Having a rotating lineup will help to keep things fresh instead of having to wait months for a change. Grovod Cavern, the Play as Monster scenario, was also changed to encompass all of the tiers, which lets everyone play together. The 1.6.2 patch was released today for SWTOR. As per usual, I ran my tools against it to see what was new. You can see the results below, there were about 242 new entries added, most of the were addressed in the patch notes. New Armor Sets. We see that Smugglers and Imperial Agents get new armor sets, which appear in the store. Consulars and Inquisitors also seem to get a new set ( Sanctified Caretaker and Malevolent Interrogator respectively). They might be found in the now available Skip Tracer pack? New Mount. There is mention of a new mount, the Firebolt. Most everything else seems to be already in the store or having to do with balance changes as mentioned in the patch notes. I may have missed something though. I hate dailies, I really do. The idea of doing the same stuff over and over again for reputation or a currency just doesn't play with me. So when I hit 50 in SWTOR, the endgame dailies became available to me. I figured I'd at least check them out and do them once. The Black Hole. Most of the missions in this area were not very memorable. There was one, Eyes and Ears, which featured a probe that followed you around to highlight where you place a listening device. You also want to avoid detection or mobs will spawn. Other than that, I didn't find much enjoyable. Section X. This is the latest daily zone, which is a lot like The Black Hole. It has several solo missions and a Heroic mission meant for a group. Being the recluse that I am, I just did the solo missions. None of the missions really stood out for me. I did like how they revolved around the Dread Masters though. Overall, you can make some good credits by running these mission, over 500k a week. The area also features a new world boss, Dreadtooth. I have not gotten to fight him, but his difficulty increasing feature sounds pretty neat. What's Next? It seems like BioWare is going to continue the trend of introducing new Daily zones. In the 1.5 files, there was mention of a new area: Rakata Prime. Not sure when and if we will see that though. Like the previous areas, I'll do them once and that's it. The big guys in the video are Play as Monster Generals which the players have taken control of. I think the Fortress system is pretty good, but there are some areas for improvement. Notifications. 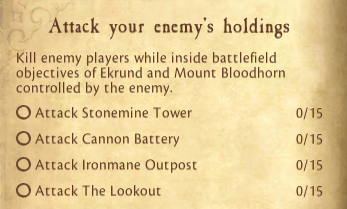 I'd love to know if a Fort is under attack. Right now you get notified if a relic is on the move in the pairing that you are in. It could be a little late at that point. I like defending things, so I'd love to know an attack is in progress. Numbers. I think it takes 9 players to get the siege camp to spawn which gives access to the rams needed to bring down the fortress doors. I'd like to see this lowered to 6, as it might make Relic attempts more common. I'm not usually one for doing New Years resolutions, but it does seem like a good opportunity to write down some goals. I don't really have any MMO specific goals though. Most of the list will be comprised of productivity goals. 2) Sites with Benefits. While I find the system useful, this coming year I'd like to get some other sites using it. If all goes well, I could turn it into an actual service instead of just a project. 3) Release a Game. Ah yes, this old resolution. I have a lot of game code, maybe this is the year it actually becomes something playable and enjoyable. 4) 3D Modeling. I'd like to learn the basics of 3D Modeling this year. I received a book about Blender for Christmas, so I should be all set. 5) Revamp the Arsenal. I'd like to give the Arsenal of WAR a bit of a revamp. It was one of my first web projects, and I have learned much since then. There you have it, 5 resolutions for 2013. And we're back from the Christmas vacation doldrums. That means it is time for episode #2 of WeritCast. This episode is about SWTOR and actually shows me raiding. Specifically, Bonethrasher in Karagga's Palace. I also talk about some of the happenings going on with SWTOR. It was a cool fight, you can't get much more iconic than fighting a huge Rancor. I ended up getting my Rakata helmet, so that was a plus. On the downside, this LFR group fell apart after beating Bonethrasher. One guy disconnected, we voted to kick, he came back just as the vote went through. Then the group just started dropping. Overall a fun time though.